Both LG and Samsung have been selling Android flip phones in their native land for a while. Doro tried a slider with the Doro 740, but European availability of an Android flip phone, from a big manufacturer, is new. Originally announced in the domestic Korean market as LG Gentle, the LG Wine Smart has a large physical 12-key numeric keypad and seven shortcut keys including one for mail and one for the 3MP camera (the Korean market version of the Wine smart gets an 8MP camera). The 3.2-inch 480 x 320 screen has larger-than-normal icons arranged in a 3x3 grid. The device includes LG’s Safety Care feature. This tags certain numbers as being people you’ll only call in an emergency. When you call them it will send the contact a text saying that it’s an emergency and giving your GPS position. The phone can also be set up to send the same text when the phone hasn’t been used for an extended period of time. Unlike some of the Raku-Raku flip phones sold for older Japanese users, it does not send a text the first time the flip is opened each day. There is no emergency button on the back – a feature which is de rigueur for the senior market. The lack of a charging dock is also a little disappointing. It runs Android Lollipop 5.1.1, and can be considered a low-end smartphone with a quad core Qualcomm Snapdragon 400, running at 1.1GHz, with 1GB of internal RAM and MicroSD expansion. With a comparatively small screen and a 1700mAh battery, the power usage should be be decent. It measures 117.7 x 58.7 x 16.6mm and weighs 143g. It’s available in blue and, appropriately enough for a phone called Wine, burgundy. 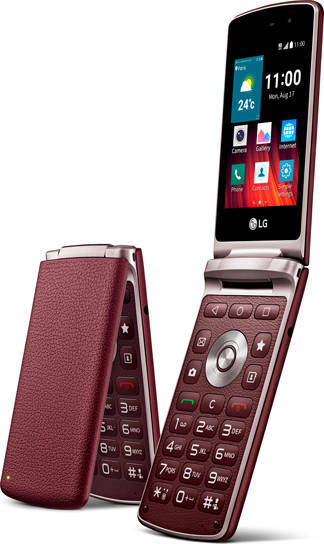 “Our goal with LG Wine Smart was to create a smartphone that fans of flip phones could embrace,” said Chris Yie, vice president and head of marketing communications for LG Mobile Communications Company. The market for senior phones in the UK is completely dominated by Doro which has more than 90 percent market share by value. Attempts to launch smartphones into the space such as the Fujitsu Stylistic have failed to mirror their Asian success, and devices such as the Kapsys remain niche.